Two weeks ago I showed you some small quilt squares I had made. 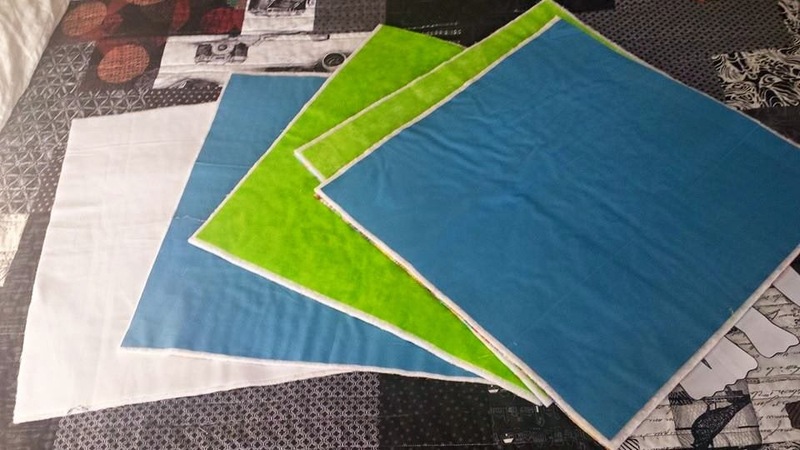 I just grabbed some random solid (ish) fabrics for the fronts and some bright novelty fabrics (the kind you buy but then never end up using) for the backs. My plan was to continue practicing my FMQ using my Angela Walters Shape by Shape book and to make older sibling gifts to go with the many baby quilts I've got in the works. I finished my first baby quilt late last week (there will be a post on that soon, I promise) and started on the accompanying big brother mini. My plan was to start with a large initial for big brother's name and then just go from there filling in the space with various fmq designs I wanted to try. So here's the first in-progress picture. After the letter E, I moved on to the pea pods and pebbles. Then I got really brave and did that swirl border. I've been drawing this one on paper several times trying to get down the movements and flow of it. I think that really helped me to stitch it without two many issues. Then for the top corner I just used one shape from the swirl border and repeated it over and over. The thread I'm using isn't showing up too well in these photos. It's a variegated Superior Threads King Tut cotton #932 in gorgeous jewel tones. Its a 40 wt, which makes the stitching show up a lot. Great for something like this but probably heavier than I would use on a real quilt. I like a thinner thread that blends better. 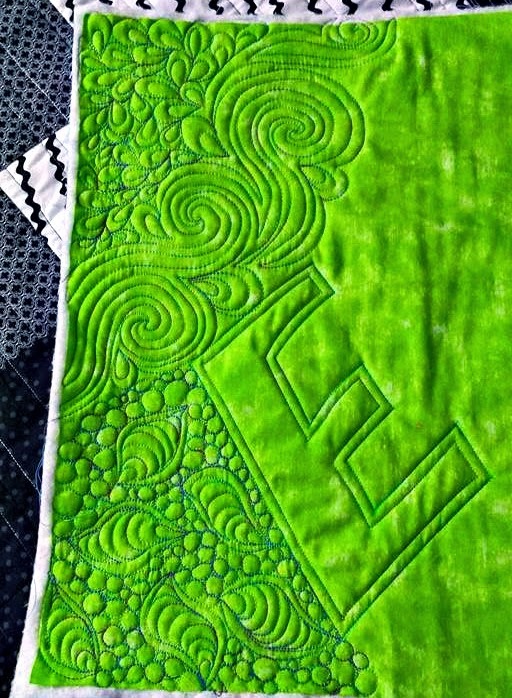 After my swirl I did some simple matchstick quilting, then some wavy lines, a feather, and some spiral squares. All of these are straight out of the Shape by Shape book. I literally propped open the book on the page I was working from and tucked it under the foot of my clear extender table. I finished up up with some clams, some swirls and then some intersecting lines. Honestly, those lines look easy but they were hurting my brain! Overall I'm pretty psyched about how it turned out. I really think that FMQ is mostly a matter of muscle memory. That is why practice is so important. And these small squares (they are each about 18-20 inches) are great. No drag and no pulling and pushing a large quilt. You can just focus on the pattern you are trying to perfect. I posted a couple of these progress pics on Instagram and used a Shape by Shape hashtag along with an Angela Walters hashtag. And the coolest thing happened! Angela Walters (angelafmq, second from the bottom) actually commented on my picture!! I was quilt geeking out! I have about four more of these to do and at least two baby quilts. And four real minis for swaps I'm in. So I better get busy! Wow! That sure is a lot of quilting! I rented time on a long arm for the first time recently but sure have a long ways to go after seeing yours. Thanks Karen. I've tried using a long arm at quilt shows and it is such a different way of quilting (moving the needle instead of the fabric) that my brain just about melts. I think I'll have to stick with domestic machine quilting. Although someday I'd love to get one of those machines they call sit down long arms. Good luck with your long arm skills. I'm convinced it is just a matter of practice. Love the quilt geek moment. I would've done exactly the same! Your quilting is superb. Well done! Thank you Sue. Yes, it was a pretty epic quilt geek moment for me. 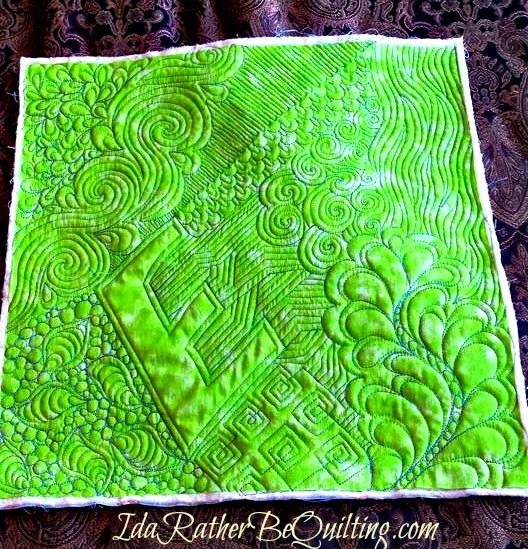 Spectacular quilting! This will be a great big sibling quilt! I'm hoping they will be a hit. I thought I'd pop by Kohls and pick up a few of their $5 plush toys to go with the mini quilts. In any case, it's good practice for me even if the sibs don't much care for them. Thanks for stopping by! Great practice squares! I love how you have put the different designs together. 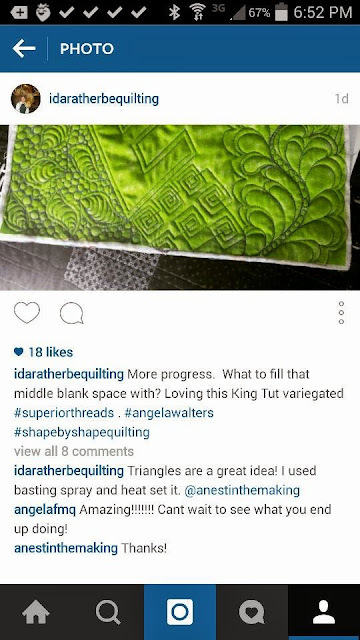 Shape by Shape is probably my favorite quilting/design book, along with Quilting Makes the Quilt. 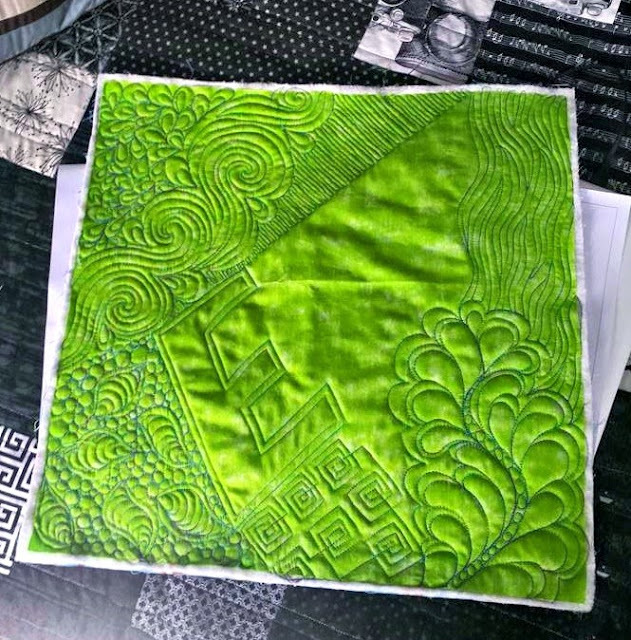 The way you have combined the patterns is wonderful - It will be interesting to see how this quilt develops. I always work on relatively small pieces, it makes life so much easier.